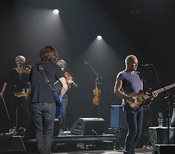 Check out Sting's Facebook page and "Like" Amnesty International to stream in full each of the 70+ tracks included on the Chimes Of Freedom: The Songs Of Bob Dylan Honoring 50 Years of Amnesty International compilation album. 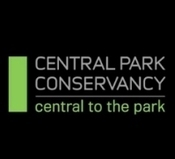 The Collection Features Songs By Adele, The Airborne Toxic Event, Joan Baez, Natasha Bedingfield, Jackson Browne, Cage the Elephant, Elvis Costello, Darren Criss, Miley Cyrus, Dave Matthews Band, K'NAAN, Ke$ha, Mark Knopfler, Diana Krall, Lenny Kravitz, Kris Kristofferson, Ziggy Marley, Maroon 5, Tom Morello, My Chemical Romance, Joe Perry, Queens Of The Stone Age, Raphael Saadiq, Seal & Jeff Beck, Silversun Pickups, Patti Smith, Sting, Sugarland, Pete Townshend, Lucinda Williams, Evan Rachel Wood. Two iconic forces that have impacted the past 50 years – the life-saving human rights activism of Nobel Peace Prize-winning Amnesty International and the incomparable artistry of Bob Dylan - are being saluted by 80 musicians who contributed new or previously unreleased recordings to Chimes of Freedom: The Songs of Bob Dylan Honoring 50 Years of Amnesty International. 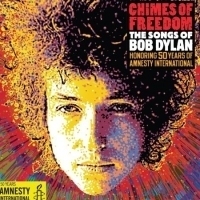 Chimes of Freedom is Executive Produced by legendary music executive Jeff Ayeroff and Julie Yannatta, who spearheaded Instant Karma: The Amnesty International Campaign to Save Darfur - a 2007 collection of John Lennon solo compositions performed by major artists including U2, Green Day, and R.E.M. The collection is scheduled for physical (4 discs) and digital release in North America on January 24, 2012 through Fontana Distribution. It will be distributed internationally through Fontana International, a Universal Music company, on January 30. Chimes of Freedom features a stellar and diverse group of artists across the generational and musical spectrum. The performers, including many of Amnesty International's longtime supporters, range in age from teenage pop star Miley Cyrus, 19, to folk music legend Pete Seeger, who, at 92, records Dylan's poignant "Forever Young," with a children's chorus. The diversity of the musicians and musical genres - from rock, rap, hip-hop to pop, folk, country, jazz and blues - attests to Amnesty's depth of support in the music community, the universal appeal of the core message of human rights, and the breadth of Dylan's impact on culture. Almost every track on the album is being released for sale for the first time - except for the title song, Dylan's original 1964 recording of 'Chimes of Freedom'. Seventy songs were recorded especially for this release - with the addition of a few previously unreleased recordings. "This album is a powerful fusion of the music community's respect for Amnesty's life-affirming work and for Bob Dylan's enduring brilliance," said Ayeroff and Yannatta. "We are proud to have worked with Amnesty to produce this remarkable project." In 1962, Amnesty International evolved from a one-year campaign to free political prisoners into a worldwide movement fighting for justice, freedom and human dignity; today the organization has more than three million supporters in 150 countries. In March of that same year Bob Dylan's debut album was released, launching an unparalleled recording career. "Over the half century, Dylan's art has explored and expressed the anguish and hope of the modern human condition," observed Sean Wilentz, the noted historian, in the album liner notes. "Bob Dylan's music endures because he so brilliantly captures our heartbreak, our joy, our frailty, our confusion, our courage and our struggles," said Karen Scott Amnesty International's Manager of Music Relations. "His words convey a depth of meaning that few artists can equal, inspiring us and always moving ahead of our expectations. We at Amnesty International are deeply grateful to this legendary musician and to all of the artists who have contributed to this project." All of the artists, session musicians, arrangers, engineers, producers and recording studios worked pro-bono to support the human rights cause. Almost 30 tracks on the album were mixed gratis by famed engineer Bob Clearmountain. Bob Ludwig and Adam Ayan of Gateway Mastering donated their mastering services. The album cover illustration is by Grammy Award winning artist Mick Haggerty. Eight tracks were produced or executive produced by Martin Lewis, who as co-creator/producer in the 1970s of Amnesty's ongoing "Secret Policeman's Ball" benefit series, instigated Amnesty's outreach to rock musicians by recruiting and producing Pete Townshend, Sting, Eric Clapton, Jeff Beck, Bob Geldof and others. Executive Producers for Amnesty International are Helen Garrett, director of special projects, and Karen Scott, manager of music relations. Through Chimes of Freedom, Amnesty International seeks to enlist support for its fight against censorship and attacks on free speech - whether involving artists, writers, musicians, political activists or bloggers. In this campaign, Amnesty is fighting for people such as the imprisoned Nobel Prize winner Liu Xiaobo in China, a scholar and human rights defender imprisoned since 2009 for writing about corruption and criticizing China's political system. In addition to purchasing the album at www.amnestyusa.org/chimes, supporters will find actions they can take to help individuals whose freedom of expression is under threat. Amnesty International is a Nobel Peace Prize-winning grassroots activist organization with more than three million supporters, activists and volunteers in more than 150 countries campaigning for human rights worldwide. The organization investigates and exposes abuses, educates and mobilizes the public, and works to protect people wherever justice, freedom, truth and dignity are denied. For more information, please visit: www.amnestyusa.org.